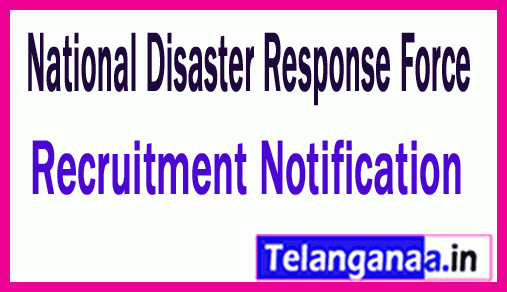 An employment notification regarding NDRF recruitment has recently been advertised by the National Disaster Response Force so that the targets of Assistant Commandant, Principal Private Secretary, can be made to inform goal-oriented and skilled competitors. Eligible Job Hunters can apply for NDRF vacancies by filling out the offline application form and within 30 days. Participants are advised to submit the relevant documents with the NDRF application form by the last date which is within 30 days. Goal-oriented and skilled, the competitors can get complete information about the NDRF recruitment 2018, can go from this page which is provided by the team of www.telanganaa.in. Essential qualifications: Job seekers should have an officer under the Central / State Government. Age of the candidate should not exceed 52 years. Salary Structure: Applicants who are successfully selected against this recruitment will be given Rs. Will receive effective and satisfactory salary. 56,100 - 1,77,500 / - (post 1), Rs. 67,700 - 2,08,700 / - (post 2) from the recruitment of the organization. The engagement of the applicants will be done on the basis of their presentation in the test / interview against this recruitment, which will be organized by the recruitment panel of the organization. For the first and foremost step, go to the official site of the organization, which is http://www.ndrf.gov.in. Once the application has been successfully filled, the competitor should send the application along with all related documents at the address given below. Click NDRF Recruitment Notification here.